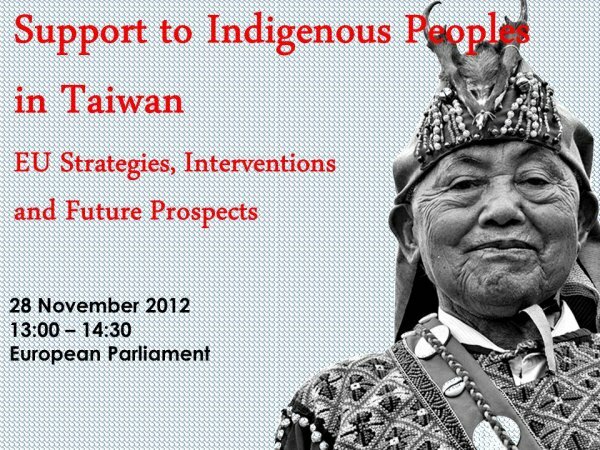 On 28 November 2012, Metin Kazak MEP opened a conference in the European Parliament organised in conjunction with UNPO examining the opportunities to advance a developmental agenda for the indigenous peoples of Taiwan under the EU-Taiwan trading partnership. Brussels, 3 December 2012 – Coming amidst intensified discussion about consolidating the EU-Taiwan trade partnership into a fully-fledged Free Trade Agreement, Metin Kazak, MEP, has brought together international experts in collaboration with the Unrepresented Nations and Peoples Organization (UNPO) to discuss “EU Strategies, Interventions and Future Prospects for Support to Indigenous Peoples in Taiwan”. Celebrating Taiwan’s rich cultural diversity and progress in recognising minority rights, this unique conference simultaneously identified opportunities to advance a more inclusive developmental model for the island’s indigenous population. Following a moving performance by soprano Lu Yu Cheng who is of indigenous Taroko descent, the conference was opened by remarks from Mr Kazak MEP, Mr Marino Busdachin (UNPO) and Dr Wan-Li Wang (Taipei Representative Office in the EU and Belgium). Ching Hsin Yu (Taiwan Foundation for Democracy) proceeded to provide a descriptive overview of Taiwan’s officially recognised 14 aboriginal tribes, highlighting the socio-economic discrepancies of this 2% of the population vis-à-vis the island’s non-indigenous inhabitants. Michael Danielsen (Taiwan Corner) proffered insight into the question of Taiwanese sovereignty, identifying areas in which the EU may support Taiwan’s enhanced participation in international fora. Professor Tsai Chih Wei (National Dong Hwa University) offered legal perspective on Taiwan’s progress in institutionalising indigenous law and highlighted the prospects for indigenous self-government. Professor Kevin T Jackson (Solvay Business School) proceeded to highlight the potential that global economic governance regimes carry for promoting grassroots empowerment of indigenous peoples, while Yedda Palemeq (Council of Indigenous Peoples) commented on the structure of the Taiwanese CIP and its five-principle strategy to support indigenous interests on the island. With particular reference to Taiwan’s indigenous peoples, Joëlle Hivonnet (European External Action Service) affirmed the EU’s commitment to promoting universal human rights and voiced the EU’s appreciation for Taiwan's democracy and efforts to implement the provisions of international covenants such as the ICCPR and the ICESCR. With greater awareness of the responsibilities of modern-day trading relations to the local populations they inevitably implicate, the conference was brought to a close on a note of anticipation about the way forward for the EU-Taiwan partnership.